Coach Bailey has been wanting to make shaksuka for some time and decided to put a little twist on the classic Mediterranean and Middle Eastern dish using some of her favorite ingredients. While this may look like it took time to make in the kitchen, it is probably one of the most simple dishes, primarily made up of only 2 ingredients. Full of flavor yet light, it the perfect lunch or dinner! Place jar of salsa in small skillet. Crack eggs and drain a little of the white. Place eggs on top of salsa and cover until egg is to desired consistency. Sprinkle some cracked pepper on eggs, and once cooked, top with scallions, avocado, cherry tomatoes, feta and cilantro. Dip with your favorite chips! 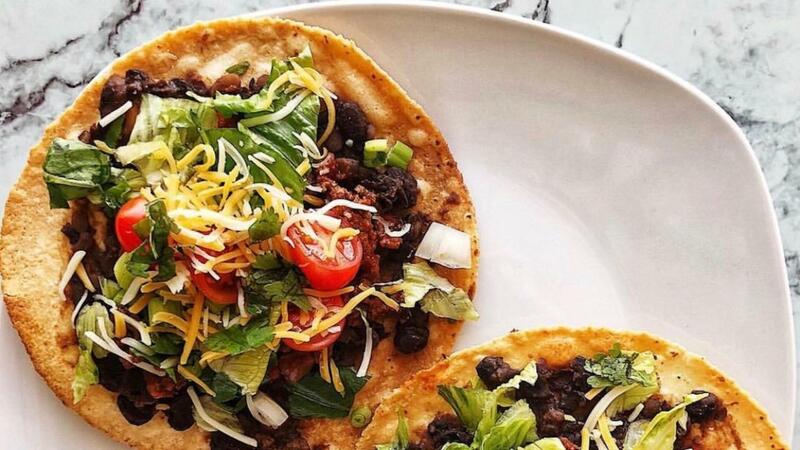 We suggest using Siete grain-free tortilla chips. Enjoy! If you are looking for a way to use the veggies that are about to go bad in your fridge, this is the recipe for you! Veggie hash is a great way to incorporate vegetables in your diet and you truly cannot go wrong with the mix. I had zucchini, orange bell pepper, sweet potatoes, red potatoes, and corn that I needed to get rid of. This is when the veggie hash was born! Add two eggs cooked to your liking on top and it makes a perfect meal you and your family (even the kiddos) will love! Chop all vegetables and mix with oil and garlic add salt and pepper and cook till tender. Top with two eggs and cook till liking! Enjoy! We are ALL about trying to come up with healthy swaps for some of our favorite meals. We love tostadas, but most contain processed, refined grains. Not anymore! These tostadas are made with our favorite grain-free tortillas Siete Tortillas. They are made with almond-flour and we promise, you and your family won't know the difference. The best part, these were actually leftovers from the taco bowl in our plan! Quick, easy, and delicious, that is what we look for! If you do not have our plan, be sure to check out the About Our Program tab at the top of our homepage. Who doesn’t love a good waffle!? We love waffles here at Fit Mama In 30 especially when they have added protein! We used Kodiak Cakes Buttermilk Waffle mix to make these and they turned out great! All you need to do is combine the mix with water, milk, or milk and an egg for even more protein! Quick, simple, and a meal you and your family will love in less than 30 minutes! Combine waffle mix and liquid to a bowl. Once combined, add to a greased waffle maker and cook until golden brown. While the waffle is cooking, chop one banana and heat a TBS of coconut oil on pan. Add banana slices and then sprinkle with cinnamon until each side is golden brown. Once waffle is done, top with banana and a drizzle of almond butter. (We used RX Bar Vanilla Almond Butter). Enjoy! If you are looking for the easiest dessert in the world, well… here it is! This 3-ingredient pumpkin fluff dip takes just 2 minutes (if that) to make. Great for a fall get together or to have at home for a light dessert. Serve with green apples or honey graham sticks. Your family (especially your kids) will absolutely love this! optional: sprinkle of pumpkin pie spice. Fold all ingredients into a bowl until combined. Serve with sliced green apples or graham cracker sticks. Chill, or serve immediately. Enjoy! Here at Fit Mama In 30, we are taking full advantage of the fall season and adding pumpkin to well…. just about everything. We are all about quick, simple, and nutritious recipes, and these pumpkin protein pancakes are no different. With the help of Kodiak Cakes and our favorite whey protein Isagenix, these pumpkin protein pancakes pack in 18 grams of protein per serving. Combine pancake mix, liquid, and protein. Mix until smooth. Grease pan with avocado oil (lower smoke point than olive oil) and cook until done on each side. Enjoy! If your kids struggle with eating their vegetables, this is a GREAT way to hide them! ( Yes, we have to do that sometimes). These meatballs are super easy to make and packed with shredded zucchini which, keep them tender and moist. The sauce doesn’t require a ton of time because it is from a jar! Thats right… from a jar, but no worries, there is no added sugar and it is the healthiest jarred pasta sauce we have come across. We are all about quick and easy and these are no different. A favorite in our home and now yours too! It’s official, we have entered full on cozy food mode and we don’t see ourselves straying from it anytime soon. Currently all we can think about is slow cooked dishes, soups, pastas, and bowls of chili. Speaking of bowls of chili… this white chicken chili is full of protein and fiber to keep you feeling full and satisfied! The perfect pairing to a chilly fall or winter day!